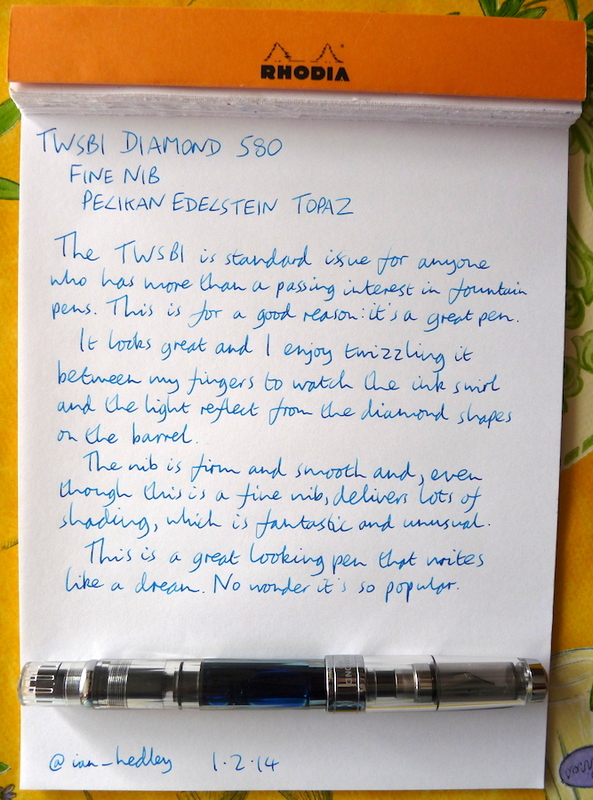 TWSBI Diamond 580 fountain pen review – Pens! Paper! Pencils! 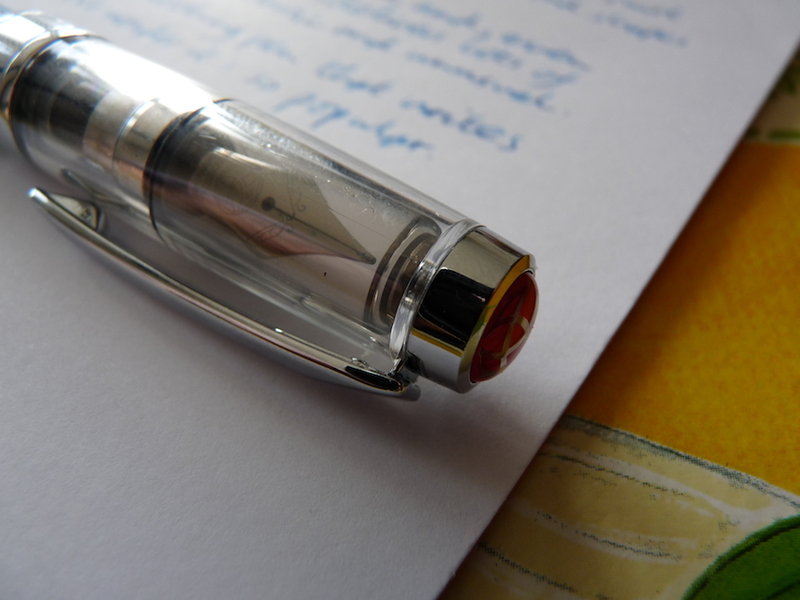 The TWSBI Diamond 580 frequently features in Top 5 lists and this is because it’s a very good pen. It’s a good size and weight. Everything about the pen suggests solid reliability. 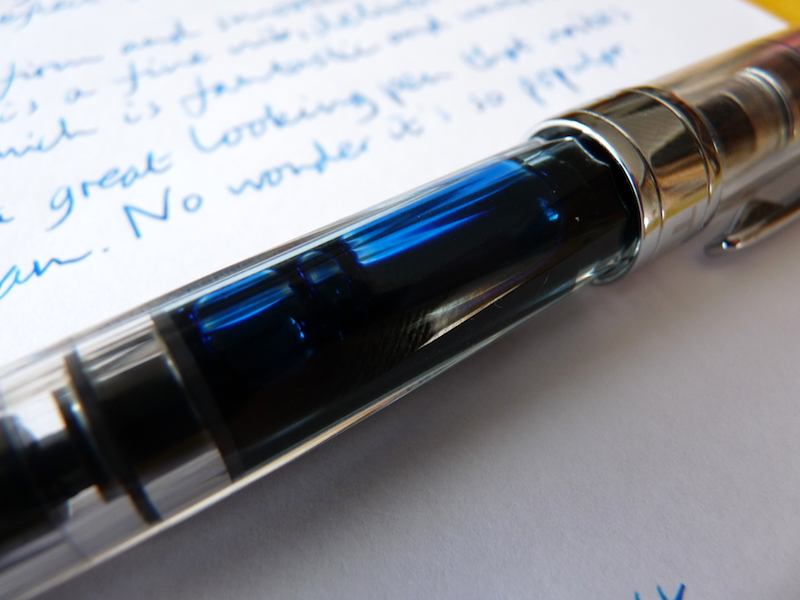 All clear fountain pens are described as demonstrators but in the TWSBI Diamond 580’s case the word really does seem apt: all the pen’s innards are on display and the machinery of the pen truly is being demonstrated. It reminds me of those clear models of engines you sometimes find in museums. It’s interesting to see the piston filling mechanism in action and once full of ink it looks beautiful, twirling around under the diamond facets. It holds a lot of ink. It’s not a delicate pen and it doesn’t have a delicate nib either. It’s a firm steel nib. You don’t get a lot of feedback while writing but even in the fine iteration I have here it gives a certain amount of shading. It’s a screw cap with a reasonable though unspectacular clip. The design of the cap is lovely. 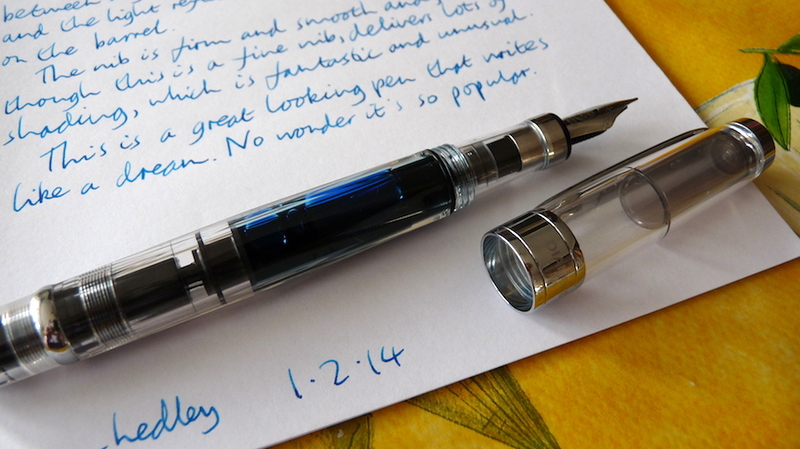 The TWSBI logo gives a nice little flash of colour and the chrome trim is tastefully done. The section is comfortable but it rotates. Mine hardly turns at all but I’ve heard of some that spin quite freely. I would imagine that would be quite distracting but mine doesn’t move unless I make an effort to turn it. For the price of a TWSBI you could get a Pilot Prera or two Kaweco Classic Sports. The Prera and Sport have slightly better nibs (in my opinion) but they are both small pens and neither are built as well as the TWSBI. The TWSBI also comes in a wide range of nib sizes and is a piston filler, which is unusual at this price point. The TWSBI is a real pen. A proper grown-up penly pen. 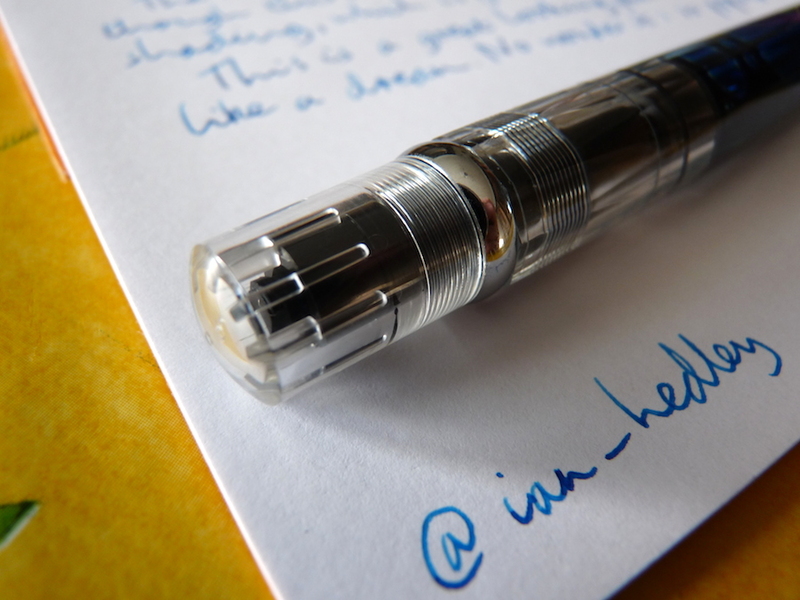 I love the TWSBI 580 – owning several of the nibs and have given this pen as gifts to family members and friends. This is my top recommended pens for users who are ready to move up from a $10 – $25 starter fountain pen. Thanks Paul. Yes it’s a top pen. My first fountain pen! I really love it but prefer a smaller pen and have just purchased the pilot Prera which is a gorgeous pen to write with. I went for the medium nib on my 580 and will probably get a fine nib soon for it. The 580 certainly does feel nice and weighty in the the hand, substantial and solid rather than heavy. Spot on review, Ian. I love my 580 – definitely in my top 5. I’m a sucker for demonstrators and this one is my favorite. I’ll take this TWSBI over two overpriced Sports or a “Lady’s Pen” Prera anyday! One of the best things is the seal inside the cap. 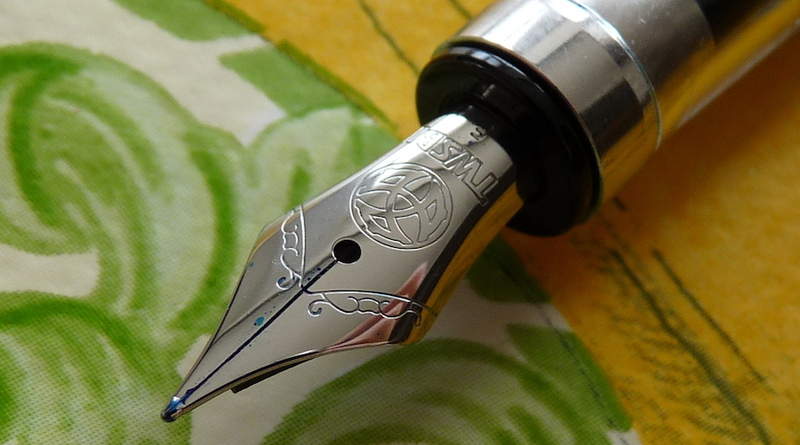 The section butts up against a rubber ring that seals the nib in an airtight space so it does not dry out. I have one in my pen case and after a month of no use at all it started instantly when I needed to use it. There are not many pens that run as well as that and it is not a particularly expensive pen. I’d say the TWSBI EF would be your best bet if you something about the same.